Stay on the top of your game! Whether your boy plays or they just loves to watch, they will love this great baseball design! 6mm Optic Cat's Eyes with Sterling Silver Seamless rounds. Pick your color Cat's Eye beads! Includes a highly polished stainless steel Medical ID Tag with 8 lines of engraving! 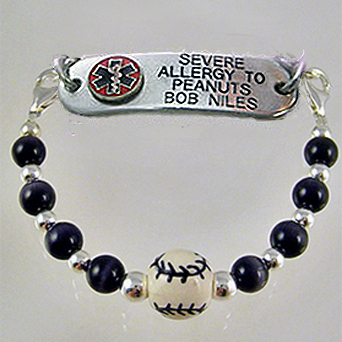 Price includes: One Petite stainless medical id tag with laser engraving and interchangeable beaded strand., two lobster clasps..
MEDICAL EMBLEM WILL BE EMBOSSED & ENAMEL FILLED AS SHOWN ON THE ADDITIONAL PHOTOS WITH THE EMBLEM COLORS, AND NOT A RAISED EMBLEM AS SHOWN IN MAIN PHOTO!.